Great Britain and Ireland beat the USA to regain amateur golf's Walker Cup at Royal Lytham & St Annes. The hosts won 16½-9½, securing victory with six matches to go and finishing with their best-ever points tally. Leading 10-6 after the morning foursomes, they needed only 3½ points from 10 singles matches. Victories for English pair Ashley Chesters and Jimmy Mullen, Cormac Sharvin and a half from Paul Dunne secured GB&I's ninth Walker Cup win. They have won five of the past six contests at home. Shropshire's Open Championship hero Chesters, at 26 the oldest member of the team, beat Jordan Niebrugge 3&1 for the first points of the afternoon to earn him three and a half points from a possible four. The Walker Cup has been contested 45 times since the inaugural match on Long Island in 1922. The USA have won 35 matches, while Great Britain & Ireland have won nine times. The 1965 match at Baltimore was tied. Niebrugge lost all three of his matches, two months after finishing sixth at St Andrews in the Open, two shots ahead of Chesters. 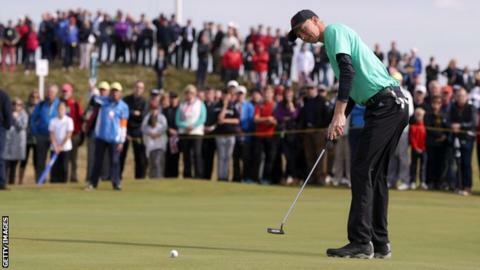 Sharvin then beat 52-year-old Mike McCoy 4&3 before Mullen, from Devon, beat Denny McCarthy to become the first GB&I player to have a perfect 4-0 record since Paul Casey and Luke Donald at Nairn in 1999. "It didn't matter if I won all of my games, as long as the team won. That was the main thing," said Mullen, from Royal North Devon, at Westward Ho. "To win all of my games was just the icing on the cake."